A fact-based, research-conceived ABM Benchmark Assessment Tool. 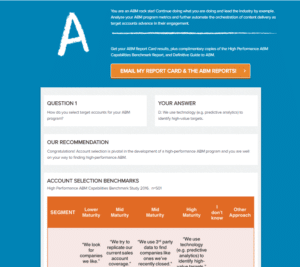 And, when you email the results to yourself, you will receive free copies of both groundbreaking Account Based Marketing content assets built by the Consortium: ABM Capabilities Research Report and the High-Performance ABM whitepaper! This interactive assessment is based upon the ABM Capabilities Framework and the first-ever research report that clearly defines the pathway to high-performance Account-Based Marketing. More than 500 ABM practitioners completed this survey and from it we are now able to clearly delineate the difference between programs and the underlying activities that generate low, medium and high performance results. How does your ABM program stack up? Find out now!